Now available in Colorado at wholesale and dealer prices, the Solene\Corona SLCO-40 panel is a high quality panel with both flush and tilt mount factory hardware. The 4’ x 10’ Corona has the highest energy output of any panel less than 40 square feet. We encourage you to compare panel performance ratings and pricing. We provide you with third-party ratings and methodology to achieve this goal. Capitol Solar Energy also builds custom tanks which offer many advantages ranging from size optimization, to on-site assembly, to optimal performance and interaction with solar panels. Capitol Solar Energy is the exclusive Colorado distributor of Solene-Corona solar panels. These panels have demonstrated top-level performance in industry ratings, capturing up to 78% of the sun’s energy under optimal conditions! We also source prime-quality used panels at affordable prices. Both of our new and used panel solutions offer some of the very best ratios of energy production per dollar in the country. 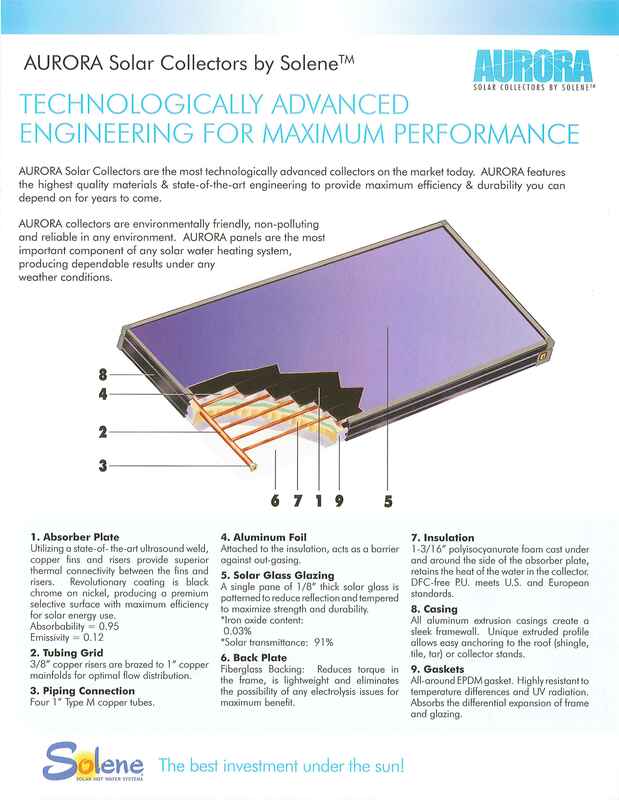 Thermal performance ratings, derived from the FSEC testing and certification program, are a useful tool in comparing the efficiency and economics of various flat-plate solar collectors. Since collectors used in domestic hot water (DHW) systems typically operate in the intermediate temperature range (120°F-160°F), this is the rating provided for comparisons. It must be stressed that these comparisons are only a guide and should not be considered as a rank ordering of collectors. Such considerations as component sizing and proper installation procedures are equally important in determining a system's overall efficiency. In addition, because of the variability of weather conditions, instrumentation accuracies, and other test condition constraints, the thermal performance of any two collectors should be considered approximately the same if their ratings are within 25 Btu/(ft²day) of each other. 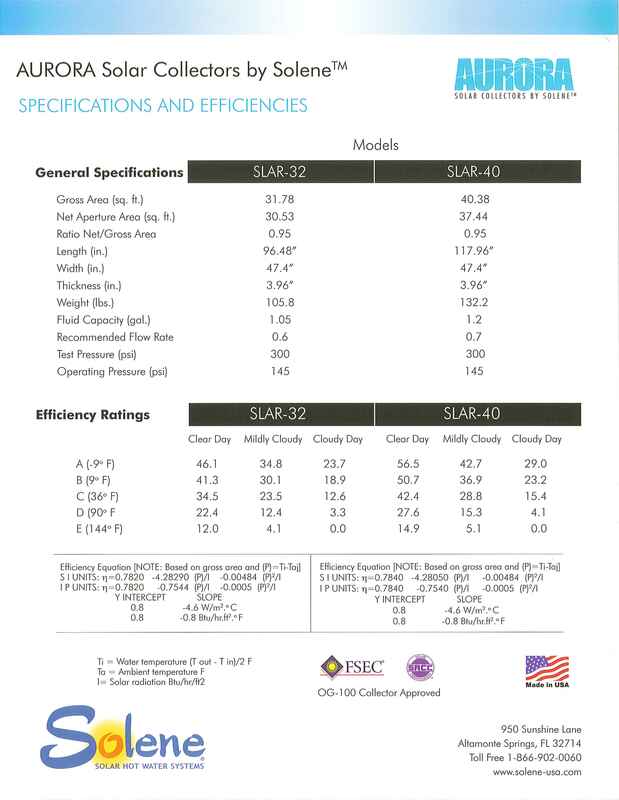 Bear in mind that comparisons based on these ratings address thermal efficiency and energy output per investment dollar only; they do not imply equivalent reliability or durability among collectors. 1) To compare the thermal efficiency of different collectors, look at the Btu/(ft²day) rating (last column); the higher the number, the better the solar energy collection efficiency (which means it will require fewer square feet of collector area to do the job). 2) To determine the collector that supplies the most energy per investment dollar, divide the Btu/day rating (next to last column) by the total installed cost of the system, then multiply the result by the number of collectors used. Example: Collector X has a Btu/day rating of 25,000. Your dealer has given you a price of $2,000 for an installed system consisting of two collectors. Calculate as follows: 25,000 ÷ 2,000 = 12.5, 12.5 x 2 = 25 Btu/day per dollar invested. The data charts below are from the Florida Solar Energy Center. These give energy production data for our Solene-Corona panels, as well as other leading selective-surface panels and evacuative tubes panels. Solene panels produce more energy per day than comparable panels. Combined with aggressive introductory dealer pricing, Solene panels simply offer you the best return on investment in the industry. Beijing Sunda Solar Energy Technology Co. Ltd.
Capitol Solar sells custom-built large capacity tanks for drain-back systems or closed loop systems. Our non-pressurized heat-exchange tanks are the most cost effective storage available. Our standard 4’x8’x5’ tank stores 670 gallons, optimizing home applications in multiple ways: large energy storage capacity, lower average operating temperature helping panel efficiency, efficient material usage and minimal carbon footprint. Also, we can assemble our tanks inside the chosen room, avoiding door-size issues. 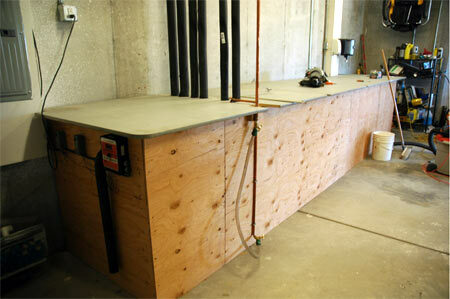 We can custom-build tanks ranging from 300 to 1200 gallons, with an EPDM-liner. Below is a custom tank which doubles as a work bench. Capitol Solar Energy offers Solar contractors throughout the state of Colorado full technical and design assistance based on 25 years of experience. Contact us for assistance; we want the solar industry to grow and quality to prevail.